After entering one or more email addresses, you can select to Apply this share to all subprojects. That will mean all current subprojects will be shared too. It’s very important to know that each project is shared separately. So when you share a project and select to share all subproject, it will apply the same share settings and addresses to all the subprojects one by one. Eventually each sub projects can have different list of people. 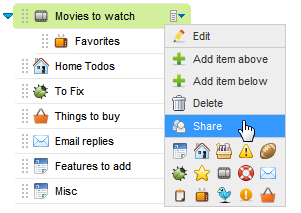 When you move out a subproject, it won’t delete the shared settings, so it will still be shared. The same way when you are adding a subproject to a shared project, it won’t get automatically shared. It makes sharing very flexible and it’s easy to share each project differently. At the same time, it’s easy to overwrite the share settings for the subproject by opening the settings for the parent project and just apply this settings to all subprojects. When you share a project with someone he receives an email notification about it. He doesn’t need to have a Pro Account to access the project you shared with him. 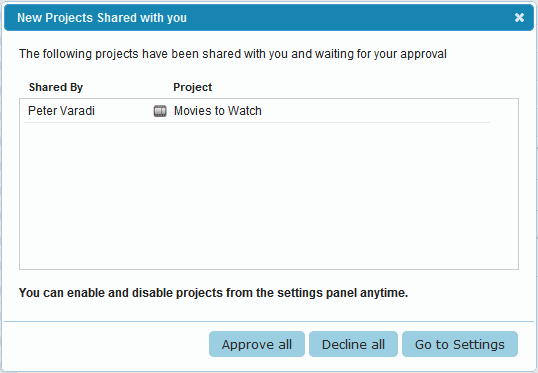 When he logs in to Todo.ly he will see a dialog window asking to Accept the new Shared Project. After accepting the project, it gets added to his project. From this point he can move the project where he just want, rename, change the icon, these won’t affect the name or location of the original project on your list. These are user specific settings and each user can relocate their project or name it as they want. If they move other projects into this project, the new projects won’t be shared automatically. The sharing is not inherited, each project is handled separately. They can however choose to share their own projects with you or with anyone. A project can only be shared by its owner. If you share a project with someone, he can access the tasks, edit, delete, and check them, but they cannot re-share your project with others. The project owner owns all the items that gets added to the shared project. In case he chooses to stop sharing the project, he will keep all the items in it. Each shared project is marked with a special icon that reminds you that it’s a shared.